Harrogate Mumbler is run by local mum of two Sally Haslewood, and has been her third ‘baby’ since launching the website in November 2012. Sally was born and brought up in Harrogate and is a passionate advocate of the town and all of it’s lovely people. 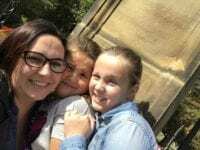 After 12 years of living away and following her husband’s job (who was serving in the forces back then) Sally came back home to settle once again in Harrogate just four days before her second daughter was born. Familiar with the town, but unfamiliar with it’s parenting community Sally saw a gap in the market and Mumbler was born. Initially as a Facebook chat group in 2011 it’s popularity rapidly grew and saw the launch of the Harrogate Mumbler website in 2012, the first Mumbler Awards in 2013 and the first franchised Mumbler site in Hull in 2014. A general note about advertising on Harrogate Mumbler. “Harrogate Mumbler is my job and and am one of the lucky few who gets to make a living doing what I love. Whilst I would never ever charge mums for using my site, companies do pay me to advertise and to promote themselves on this website and social media and I make no secret of that. It is very similar to how traditional advertising works, like in a magazine or local newspaper or radio. I also subscribe to affiliate schemes whereby if a Mumbler clicks a link on my website and purchases an item then Mumbler may get a small commission, at no extra cost to the customer. I will only put items on that are relevant as my blog and the Mumbler community and if I genuinely have or would use them myself.